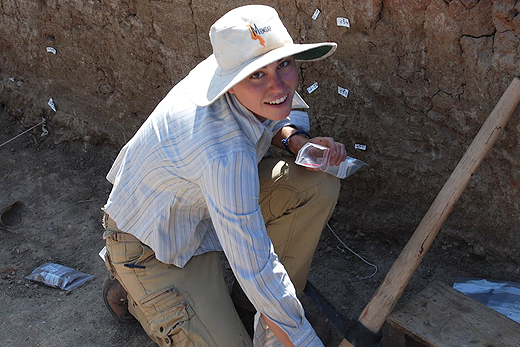 Anthropologist Jessica Thompson, lead author of the study, at work in the field in Africa. She specializes in the study of what happens to bones after an animal dies. Marks on two 3.4 million-year-old animal bones found at the site of Dikika, Ethiopia, were not caused by trampling, an extensive statistical analysis confirms. The Journal of Human Evolution published the results of the study, which developed new methods of fieldwork and analysis for researchers exploring the origins of tool making and meat eating in our ancestors. The paper supports the original interpretation that the damage to the two bones is characteristic of stone tool butchery, published in Nature in 2010. That finding was sensational, since it potentially pushed back evidence for the use of stone tools, as well as the butchering of large animals, by about 800,000 years.